Judge Merrick Garland speaks after being introduced by U.S. President Barack Obama as his nominee to the Supreme Court in the Rose Garden at the White House, March 16, 2016 in Washington, DC. *President Obama on Wednesday announced his choice to replace Justice Antonin Scalia on the Supreme Court, but the Republican leaders in Congress immediately doubled down on their decision not to hold a confirmation hearing, or even meet with the nominee. 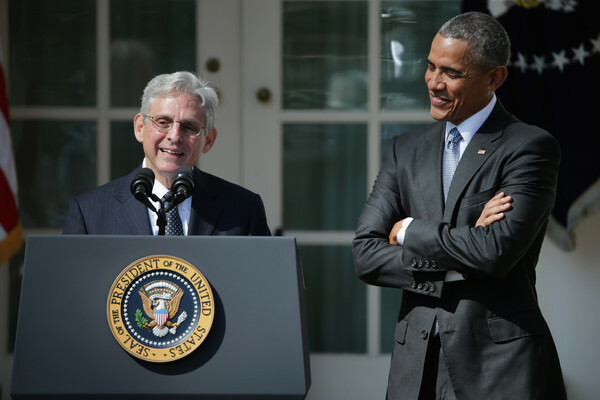 In nominating Merrick Garland, the chief judge of the U.S. Court of Appeals for the District of Columbia, to the Supreme Court, Obama called on Republicans to allow a hearing and vote on the nominee. “It is tempting to make this confirmation process simply an extension of our divided politics, the squabbling that’s going on in the news every day,” he said. “But to go down that path would be wrong. It would be a betrayal of our best traditions and a betrayal of the vision of our founding documents. Senate Majority Leader Mitch McConnell (R-Ky.) on Wednesday shot down the idea of Garland getting a hearing, pointing to Vice President Joe Biden’s own words in 1992. The then Senate Judiciary Chairman said a hypothetical Supreme Court opening should not be filled during a presidential election year, and that it was acceptable for the court to only have eight justices temporarily. Speaker Paul Ryan (R-Wis.) stood by McConnell’s decision. “This has never been about who the nominee is. It is about a basic principle. Under our Constitution, the president has every right to make this nomination, and the Senate has every right not to confirm a nominee. @SenAlexander and @SenBobCorker I’m a Tennessee voter and I demand that you #DoYourJob! Consider Obama’s nominee for SCOTUS!! Next ArticleNew Babies for Ne-Yo & Crystal and Chris & Adrienne Bosh!